Now you can enjoy using straws without having to throw away plastic all the time! 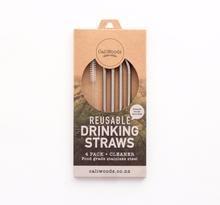 CaliWoods Reusable Drinking Straws are a fresh, new product and the perfect addition to your daily eco-routine. A set of CaliStraws will last for a long time because they are extremely durable. The Reusable Drinking Straws are made from food-grade, type 304 stainless steel. This makes them really easy to clean as well as being dishwasher/steriliser safe. You can simply rinse your reusable straws out after each use and pop them in the dishwasher. Not to mention that all packs of CaliWoods Metal Straws come with a specialised cleaner brush. The Metal Drinking Straws are premium quality and are polished for a beautiful shine on the outside. Choose the Reusable Drinking Straw Pack if you normally drink 'thin' liquids through a straw such as water, juices or lemon water.